"A carnival of crime" took place in Los Angeles between last night and early this morning, the undisputed high point of which was a shootout at the Elks’ Club. 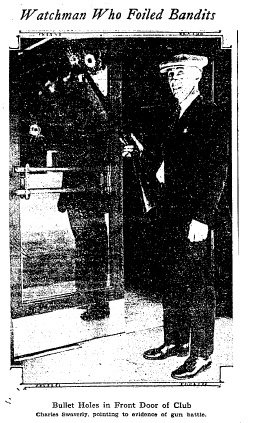 Shortly after dawn, two men walked into the venerable lodge located at Sixth and Park View. One of them carried a black traveling bag, but neither of them sought lodging for the night. Instead, they pulled a gun on the cashier and asked, in the best time-tested bandit fashion, for him to "stick ’em up." The man with the bag then walked behind the counter and forced open the safe, placing wads of cash and silver coinage into his portmanteau. The thieves had retreated about halfway across the lobby when night watchman Charles Swaverly appeared at the top of the stairway to the second floor, his rifle aimed squarely at the bad guys. "Throw up your hands," cried Swaverly, whereupon the man carrying the money bag dropped to his knees and raised one hand above his head. "Both hands," replied the cool-headed defender of the Elks, upon whose recollection of the incident we must depend. The bagman dropped his booty and raised his other hand, while his partner took cover behind a column. When Swaverly ordered him to come out with his hands up, he sent a bullet whizzing past the night watchman’s right ear. Swaverly and the gunman spent the next minute shooting up the Elks’ Club lobby. When Swaverly stopped to reload, the robbers hightailed it, leaving the bag of loot behind. By the time he made it outside, the getaway car was too far away for Swaverly to identify its make or model. In this morning’s Times, it all sounded a bit like a Fairbanksian fantasy, but the police were clear: thanks to Swaverly’s gunslinging, the Elks recovered thousands of dollars.